John McDaid's traversal of Uncle Buddy's Phantom Funhouse, conducted by Dene Grigar, took place on Thursday, August 8, 2013 in the Electronic Literature Lab at Washington State University Vancouver as part of the Pathfinders project. The conceit upon which Uncle Buddy’s is built (you receive a box of seemingly random items from your Uncle Buddy’s literary estate) was derived from McDaid’s personal experience: In 1986, the same year McDaid began work on Uncle Buddy’s, his dying Aunt Rita sent him a See’s candy box filled with odds and ends that constituted a portion of her “estate” that she wished to give McDaid. The video of the traversal is divided into six parts and reveals to us the craft and conceptualization underlying the work. The commentary provided on this page was written by Moulthrop. McDaid Traversal, Part 1,"Opening the Chocolate Box"
"A chocolate box full of death:" McDaid opens and inventories the box-of-stuff that is the Funhouse. Contents: a How-to-Guide; A sheet instructing how to load the files; a CD, taking the place of 5 diskettes in the original. McDaid presents the Funhouse as a move beyond exclusively text-based fictions, as in text adventure (IF) or the Storyspace fictions. Its principle: "modally appropriate artifacts." You are the literary executor of a vanished science fiction writer. 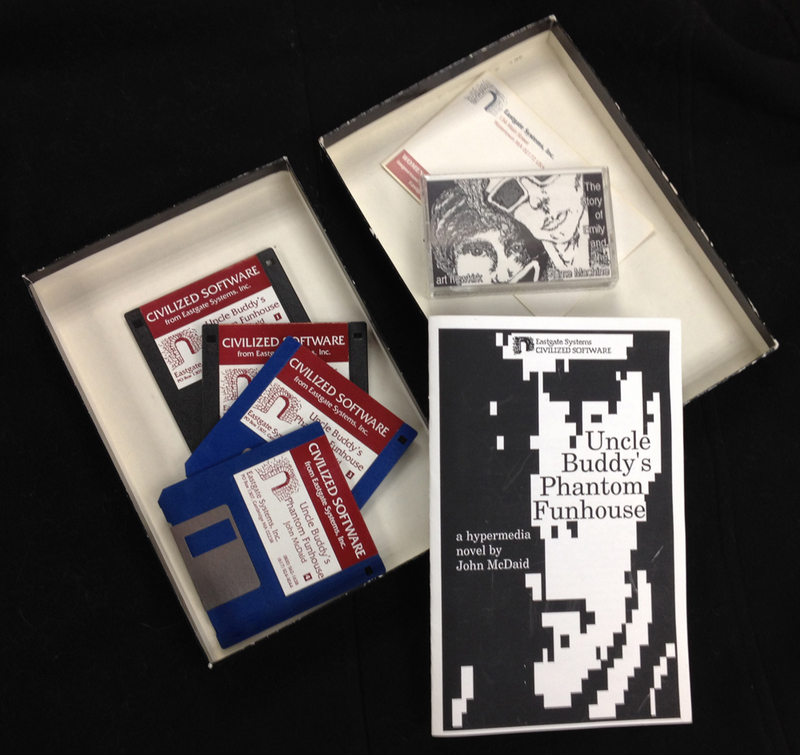 More box contents: cassette tapes, The Story of Emily and the Time Machine, Retribution. At the bottom of the box: a letter from an editor and page proofs of "Tree," an 8,000-word short story scheduled to run in Vortex: The Anthology of Cyberfiction. McDaid begins the traversal by loading the Story of Emily tape into the player and playing the first track: "Looking at a picture of you, traveling through time." Fade audio down on: "...to face the face of last night's dream." 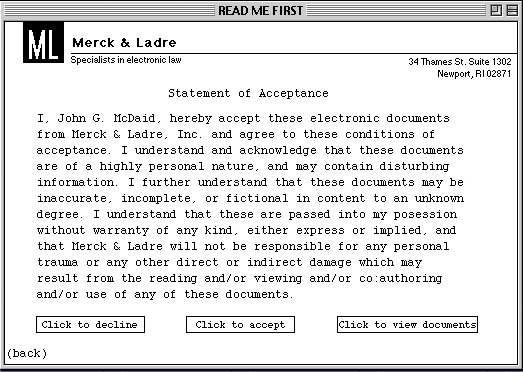 A digital lawyer's letter from the firm of Merck and Ladre, explaining that you have at some point known Arthur Newkirk, but have forgotten him due to "lapses of memory" or other "divergences of an unspecified nature." Reader is required to agree to a Statement of Acceptance, warned of "disturbing references" and advised that Merck and Ladre are "not responsible for any personal trauma" resulting from the encounter with Newkirk's effects. 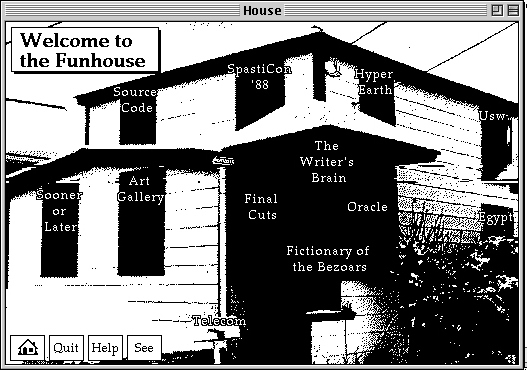 The Home Stack -- image of the Funhouse (McDaid's actual home in Rhode Island) with text links placed around it leading to other stacks: The Writer's Brain, Oracle, Fictionary of the Bezoars, Final Cuts, Art Gallery, Sooner or Later, Spasticon, HyperEarth, Usw., and Egypt. McDaid Traversal, Part 2,"Exploring the Funhouse"
Clicking on "Welcome to the Funhouse" from the Home Stack brings us to Newkirk's introduction: "Play along, for now . . . suspend, for a moment, disbelief." Also: "This is not a game. This is never meant to be a game." McDaid: imagine having to try to send a message to someone you don't know, but whose attitudes and interests you can try to hypothesize. "Believe everything at least temporarily. Believe nothing permanently." To The Writer's Brain stack -- Buddy's sketchbook. 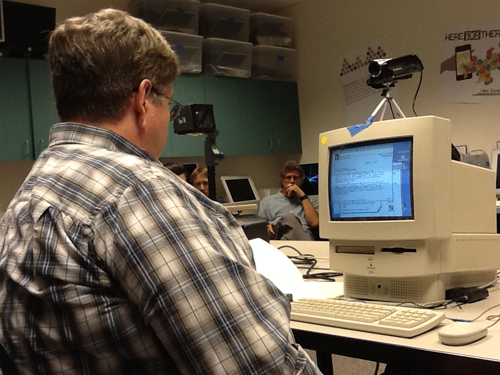 McDaid talks about the difficulty of thinking about a sketchbook in a hypermedia system -- a strange idea at the time. 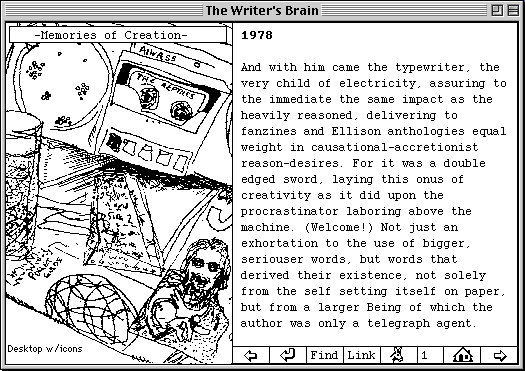 First card: "Memories of Creation - 1978" -- Buddy's reflections on acquiring his first electric typewriter. McDaid describes the interface (navigational) widgets, including the link to the Burrower, a facility that automatically rearranges the text on any card from which it is activated. He "Burrows" the "Memories of Creation" card to demonstrate. A Dadaist experiment in truth beyond rational language. McDaid flips back a few pages in The Writer's Brain, comments on its blend of word and image, stretching the bounds of hypertext to include graphics as well as words. Several cards of Writer's Brain are shown. McDaid notes that the stack is "not directly advancing a narrative," but "building up in slow incremental drips" a sense of Arthur Newkirk. 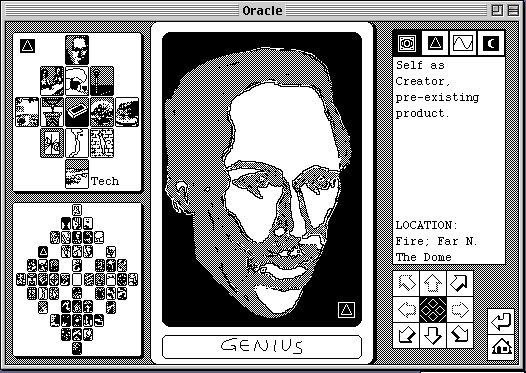 To the Oracle stack, with its four suits: Self, Cosmos, Gravity, Technology. Brief visits to several cards in this stack, including "Phantom Limbs," "Control," "Taliesin," and "Entropy Messiah." Freihoffer's Chocolate Chip Cookies; Nikola Tesla, or Genius. McDaid Traversal, Part 3, "Inspecting Final Cuts"
McDaid tours the Final Cuts stack: a "History in Lyrics" of Art Newkirk's punk band, The Reptiles. McDaid discusses the object as "modally appropriate," an experimental hypertext made by a band that lived "at the intersection of art, zines, and SF," and thus were "at home in the matrix" -- That's William Gibson's "matrix" from Neuromancer, not Neo's Matrix from the Wachowski Brothers films, which had not been made at this point. McDaid notes that the navigation options in the stack now seem unremarkable, though in a time before the World Wide Web, they were something more novel. Final Cuts is dedicated in part to "Emily." Who's Emily? McDaid begins to unfold the basic mystery of the Funhouse. In addition to an Arthur, there is an Emily around somewhere. 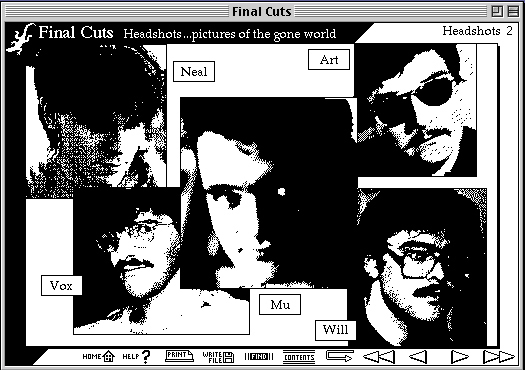 Contents of Final Cuts: front matter, headshots, chronology, discography. A list of songs and lyrics. An album (see cassette 1) called The Story of Emily and the Time Machine (1983-84). Remarks on the making of this album. Mentions of time and time machines therein. A song called "Moving Clox Run Slow." Relativity. 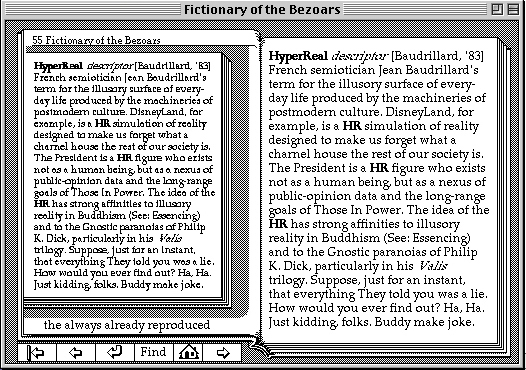 McDaid Traversal, Part 4, "Piecing Together Uncle Buddy"
Fictionary of the Bezoars, Buddy's (McDaid's) parody of Milorad Pavic's "lexicon novel," The Dictionary of the Khazars (English edition 1988). Note the advice on the title page: "other spacetimes may be almost identical but not exactly." McDaid reviews the list of words in the Fictionary: agon, albedo, asymptote; but also bagel stretcher, cardboard cone. To the bagel stretcher card: "Any abstruse . . . puzzle or diversion . . . ." The included example refers to the text-adventure version of Hitchhiker's Guide to the Galaxy (1984), in which the problem of the babel fish is a legitimate bagel stretcher. To the entry on hyperreal. Paranoia. "Suppose, just for an instant, that everthing they told you was a lie? Just kidding, folks, Buddy make joke." And McDaid make French semiotician joke -- see card. From Fictionary to other stacks: Art Gallery, a series of images; Sooner or Later, a screenplay set in the Superconducting Supercollider (back in the 1980s, not something from an alternate universe). McDaid reads from the first scene of the screenplay, notes it is about advanced particle physics, speculates on what that might have to do with time travel. Another stack: Source Code, to which Buddy's contribution is "Postscript code as poetry," an Adobe Illustrator file which (if you have a really old copy of Illustrator) will yield an image. A stack called Spasticon '88, the "hyperprogram" of a science fiction convention in St. Louis, MO. "All weapons must be peace bonded." Buddy scheduled to speak on superstring theory and postmodern science fiction. McDaid, Traversal Part 5, "Hypertextual Innovation"
We begin with the HyperEarth stack. "It's hard to remember now what things were like in the late 80s." McDaid demonstrates ability to drill down from planet view to continent, nation, region, town, and finally street. A modest claim to have invented the concept (if not the term) "Street View," now familiar from Google Earth. "This was done in 1990 before we had access to the Keyhole satellite data -- at least most of us." McDaid says his fiction is simply "anticipating what was happening already." 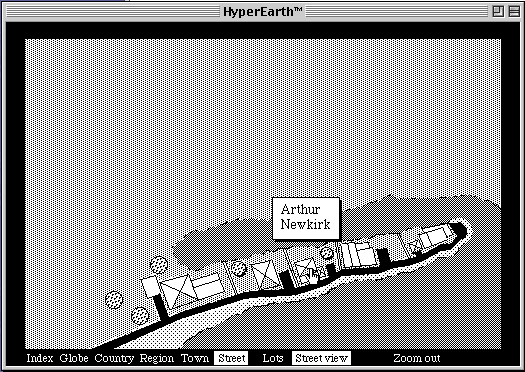 Back at the Funhouse: "the mailbox is a mailbox" -- clicking on the mailbox in the graphic takes us to Newkirk's e-mail facility, a terminal emulator called HyperTerminal. We start with Newkirk's profile statement, "My History as a Writer." McDaid sets out to read some of Buddy's mail, but the machine apparently balks. "That's how you know this is a real traversal, because every now and then the machine stops." Whatever happened was non-fatal, and McDaid continues. To the Usw. stack, with mention of a scholarly article from Jerome Brentano on "The Story of Emily and the Time Machine." To the Egypt stack, which demands: "What is the password?" 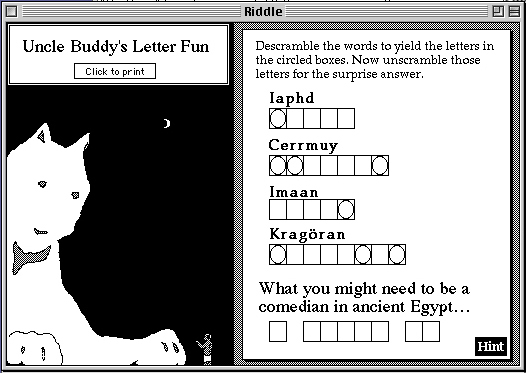 To deduce the password, we need to go to the stack called Riddle, presenting us with a Sphinx and a jumble puzzle, "Uncle Buddy's Letter Fun." What you need to be is a comedian in ancient Egypt: "a merry ka." McDaid: "I'll wait for the laugh." 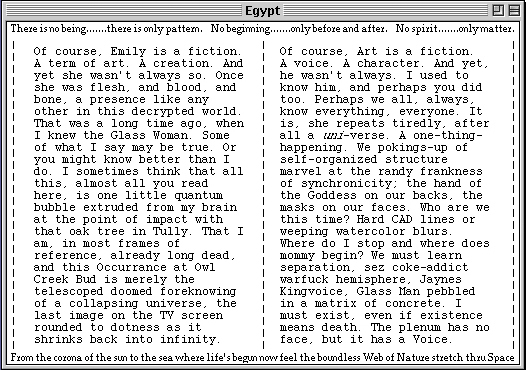 Entering the password in Egypt takes us to a new stack: Auntie Em's Haunt House, which looks nearly identical to the earlier house interface except for changed link cues: The Writer's Brain becomes The Writher's Pain; Oracle becomes Coracle; Fictionary of the Bezoars is Decorticationary of the Schizonts. Clicking on the title link at Haunt House brings up Auntie Em's welcome message, which is "halfway between Burrowed text and something else." E.g. : "pop a person into your Walktape"; "imagine if you're a pirated friend from a game." We are in a mirror world, says McDaid: Auntie Em inverts, tropes, or otherwise answers Uncle Buddy. McDaid reads at some length from the first card of The Writher's Pain, comparing it to the corresponding card in Writer's Brain. Among other things, we learn of "a field of Being, of which the Adaptive Resonance Theory [McDaid aside: "A-R-T"] was only a telegram with the author's message." McDaid Traversal, Part 6, "Mirror Image"
"We are clearly in a different place now." McDaid explores more of the differences between Emily's world and Buddy's, starting with Decorticationary of the Schizonts, which includes fewer terms than the corresponding Fictionary, "but interesting ones." Writing here "mirror[s] and evert[s]" that in the other stack. We go to the term "Dead man's book," derived from the "French" (actually Belgian) media theorist Jean Baudet, a poststructuralist for whom writing inevitably reduced to a self-referential and self-operating code. "It is the act of writing which kills the author," Baudet writes. A list of books (putatively) never written, including the sequel to On the Road, the book John Belushi was said to have been writing at his death, and The Theory and Practice of Oligarchical Collectivism, the forbidden Book of Goldstein in Nineteen Eighty-Four. Also included is The Mason and Dixon Line, Thomas Pynchon's magnum opus for which the world was waiting all through the 1980s. So much for Baudet, since this one did appear (as Mason and Dixon) in 1997. More of Auntie Em's domain: a gallery of images; screenplay for "Orpheus"; a film festival program in place of Spasticon. Binkie the Politically Correct Dinosaur, which may parody a popular HyperCard stack of the time called Inigo Gets Out, by Amanda Goodenough. HyperDeath, in place of HyperEarth. Usw. has its parody, also. And so we come to Necropolis, "the Egypt of Egypt." The password dialog here says: "What is the password." Note punctuation. Enter what (which is the password) and we come to "the endgame:" contents of Necropolis. McDaid reads at length from cards in Necropolis, including one called "Harley's Moon," which describes (among other things) the death of a New York pigeon. Also: "I found one of his fingernails in the lint screen" -- the I presumably being Emily; the fingernail belonging to -- Buddy? "There are some times when I almost seem to remember another life... Dopplering away under the pressure of the wind." Next McDaid moves (somewhat laboriously, because the machine is not cooperating) to the final card of Necropolis. "Click on the Sphinx for the awful truth." An animation ensues, then a new state of the card: "Only the hand that erases can write the true thing." "We are at the end of where we can go with this fiction," says McDaid. The final state of the card presents "two realities, right and left [Left/Rite], with valedictions by Emily and Buddy, respectively. A click brings up a dialog box: "You shouldn't have seen that. Now I'll have to kill you." 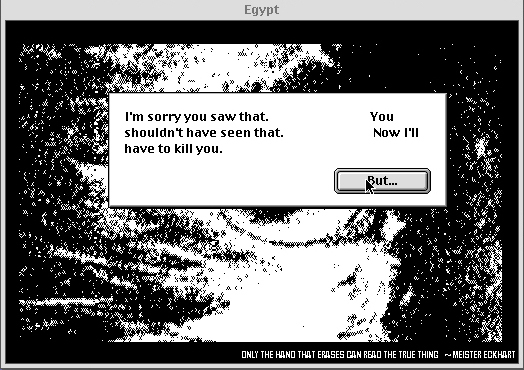 Clicking the response button ("But...") closes not just the fiction but the program that presents it: "and HyperCard is gone!" But there is "a bonus" -- an Easter egg -- for those willing to "leap outside the system." McDaid explains the resource fork of the Apple file system and the programmer's tool called ResEdit. With this tool, he looks inside the invisible file in the Egypt stack, revealing three text files, each of which he reads. Files 128 and 129 are again last words from Emily and Buddy. Buddy's includes a kind of apology for the Easter egg -- "madness at the lights!" Text 130 contains a single line in Latin: Finis coronat opus: "the ending crowns the work," or perhaps "the ends justify the means."